On October 1, 2017, Airman First Class Wilson risked her own life to save the lives of others in the aftermath of the deadliest shooting massacre in modern U.S. history at the Route 91 Harvest Festival in Las Vegas, Nevada. When sudden gunfire began, Airman Wilson immediately identified the threat and dropped to the ground. Despite the danger of active and continuous gunfire, Airman Wilson ran into the street to flag down numerous cars to transport victims to the hospital, successfully loading a number of injured victims. 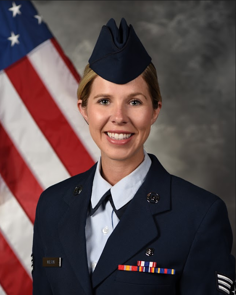 Airman Wilson then surveyed the area and directed others to obtain first-aid supplies from a nearby police car, where she applied gauze and bandages while assessing vital signs of the injured. When first-aid supplies ran out, Airman Wilson encouraged those around her to use sweaters and T-shirts as tourniquets and bandages to control bleeding. Airman Wilson worked her way through the casualty line, rendering medical aid with makeshift tourniquets and bandages, controlling venous and arterial bleeding. Airman Wilson then loaded 8 critically injured victims into a nearby car and crawled into the trunk with two victims, providing life-saving medical treatment throughout the trip to the hospital, saving both lives. Upon arrival to Sunrise Medical Center, Airman Wilson took the lead on triage and ensured the most critically injured patients were effectively identified and treated. The ASYMCA is pleased to honor Angel of the Battlefield, Airman First Class Linda M. Wilson for her exemplary courage and heroism. "Had I been at that concert and I hadn't been through basic training and my medical technician program, I wouldn't have known what to do. I instantly knew it was gunshots, we've been down at gun ranges, I've heard that noise before so I knew right away what that noise was... You always wonder if you're going to be fight or flight in a crisis but it wasn't even a question. It was just fight."